Monet: Iterant of Light (NBM, 9781681121390) received a **starred review** online on January 5. "This evocative homage to one of the titans of modern art is both a collectible and a joy to read. [...] The quality of the loving production make this a landmark in serious comics about art." Monet (NBM, 9781681121390) received a **starred review** in print and online on December 8. "This beautiful, evocative story will please fans of biography, art history, and impressionism. Highly recommended." Monet (NBM, 9781681121390) received a **starred review** in the November 15 issue, in print and online. 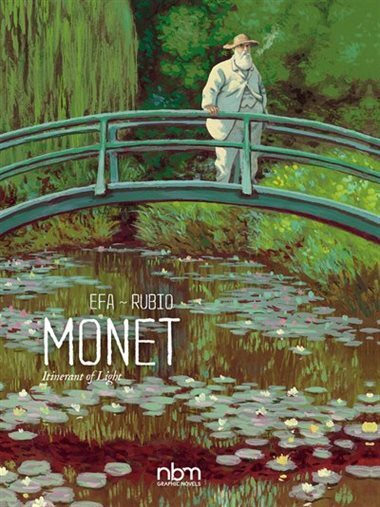 "Because Efa injects so much of Monet into his own style and Rubio presents fact as fact and conjecture as conjecture, many may think this the best of the many recent comics biographies of artists."